Stocks soar - The past few weeks in the stock market have been much like 2017 as there hasn’t been much volatility. The VIX is now down to 11.64 and the S&P 500 is closing in on its January record. The S&P 500 was up 0.46% to 2,840.35. It only needs to go up 1.1% to reach its record high. That will be tough to reach next week because the CNN Fear and Greed index is at 71 out of 100. Heading straight for the record would put the market at a very overbought level. In terms of the fear and greed index, which you can see in the chart below, the market would probably be as overbought as it was in January. Stocks soar even though the market will not as overbought as the 2017 peak. The Russell 2000 was down 0.52%. The best sectors were real estate, utilities, and consumer staples as they were up 1.28%, 1.03%, and 1.17% respectively. The only loser was energy which was down 0.47%. Oil’s drop to the high $60s has hurt the energy sector, but has helped its end users. A happy medium for the market is where oil is at now because energy firms are profitable, while headline inflation is still tepid. hat moment is over as yield fell on Friday. The 10 year Japanese yield fell from its peak of 14 basis points to 11 basis points. If the BOJ is only going to allow it to get to 20 basis points, there isn’t much room for it to increase further. Without this increase, the U.S. 10 year may not have much room to increase. The 10 year yield fell 3.71 basis points on Friday to 2.9488% as 3% acted like a ceiling on Wednesday. The 2 year yield fell 2.02 basis points which means the curve flattened to a difference of 30.56 basis points. The June factory orders report showed 0.7% month over month growth which missed the consensus for 0.9% growth and was above the prior month’s growth rate of 0.4%. Transportation, aircraft, and vehicle orders were all up. Excluding them, orders were up 0.4% which is the same as the advanced report. 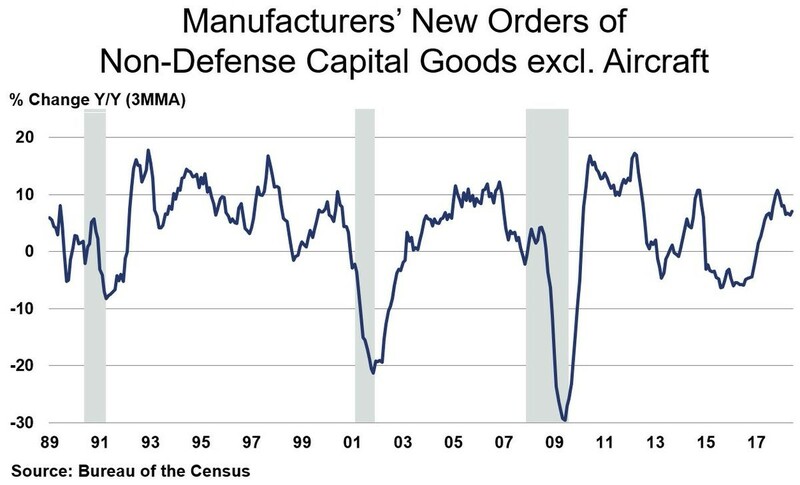 As you can see from the chart below, new orders for non-defense capital goods excluding aircrafts were up 0.3% in June. Growth has been stabilizing at this plateau. I’ve reviewed a few reports this week which saw moderate sequential weakness, but overall strength. 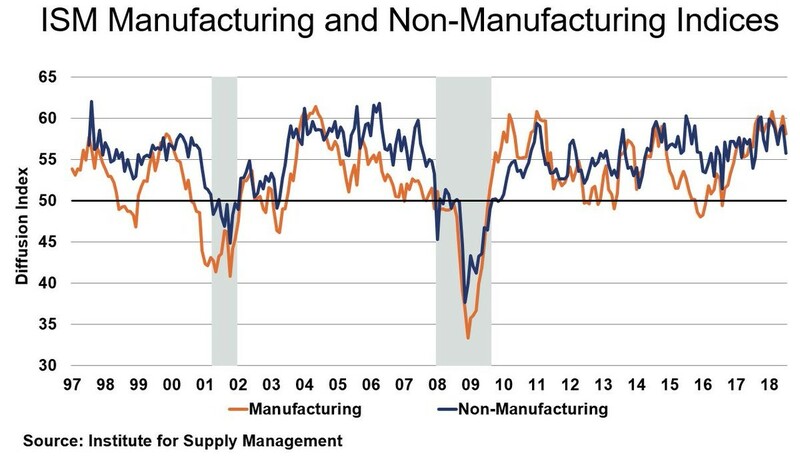 The non-manufacturing PMI was one of the weakest reports of the bunch. The report makes me question why stocks soar near their record high. It was a big miss as the PMI was expected to be 58.8 and it came in at only 55.7. That was below the lowest estimate which was 57.9. The prior report had a PMI of 59.1 which was very strong. This was the weakest reading since August 2017 which had a PMI of 55.2. This PMI is equivalent to 2.5% GDP growth. Either the soft data ISM report has become pessimistic or the economy is actually slowing. This is the exact report you’d expect if you’re following the ECRI’s prediction that growth will slow. To be clear, the ECRI growth rate improved slightly to 1% in its most recent report. Since the report had a big gap lower, there were many indexes within it which fell sharply. The business activity index fell 7.4 points to 56.5. The new orders index fell 6.2 points from 63.2 to 57. The backlog of new orders index fell 5 points to 51.5. The prices index actually rose 2.7 points to 63.4. That’s disconcerting as prices rising and growth falling are the early warning signs of stagflation. I’m not saying that trend will play out, but I am saying this wasn’t a good report. Let’s look at the quotes from this report to better understand why it was weak. Most of the quotes are positive even though the PMI fell 3.4 points. Stocks Soar, but It seems like tariffs are hurting sentiment. If the current tariffs, which are relatively small, can hurt sentiment this much, the PMI can easily fall below 50 in the next few months as tariffs are raised further. It’s interesting to hear these concerns because the Bloomberg commodities ETF has been falling in the past few months. Since its peak in May at $206.38, it is down to $193.23 which is a 6.3% drop. This decline is related to oil. President Trump’s willingness to speak with the Iranian leaders has pushed oil prices lower. Companies are clearly worried about the commodities which are being affected by the tariffs such as steel and aluminum. I’m not saying you should sell all your stocks and then go short the market. However, I am not a bull on U.S. stocks because the risks have shifted to the downside. At their all-time high they reflect the amazing earnings growth seen in Q2, but none of the risks related to the tariffs. 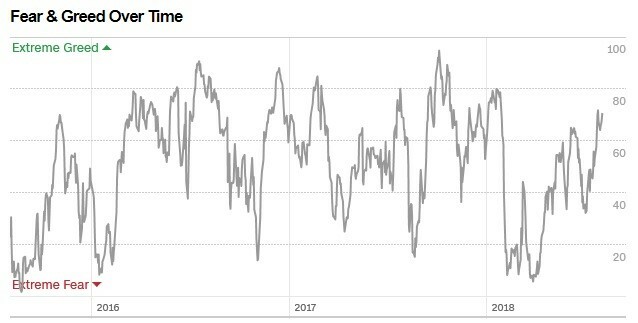 Furthermore, the CNN Fear and Greed index shows the market is overbought. There’s no reason to buy stocks at these levels since we are now at the point of the year where we look to next year’s results. Earnings growth will decelerate sharply in 2019.